Ever wondered about organizing a Star Wars costume party? Perhaps this would be a good idea for a Halloween party for the kids, but a friend is organizing one in the middle of summer, for adults. I think that he is hoping to see the girls turn up in Princess Leia costumes, I know I am! Finding kids Star Wars costumes would probably be easy, but finding one for an adult might be trickier. Anyway, the movies have such a rich background that choosing a good Star Wars costume should be a breeze. The only problem is, are you going to be on the light or the dark side of the force? Where to Get a Star Wars Costume? I am 6’5″ tall and so getting a costume to fit an adult like me can sometimes be difficult. We considered paying for a kit to try and learn how to make a Star Wars stormtrooper costume as my partner is pretty good with her hands, but making something that looks authentic would be a real task. After some thought and discussion we decided that it would be easier to look for a fancy dress hire store than caters for adults. Eventually we found one, but it is on the other side of the country and somehow paying for mail order Star Wars costumes doesn’t excite me. How do you know if it fits? How would you know if it looked good before you order? I mean what some people think is a great Jedi costume is actually a brown sack and some kind of camping light-stick! So, it looks like a roadtrip is in order. The good news is that they have a wide variety of fancy dress costumes and not just the usual Darth Vader costumes (read long black cloak and a black helmet). They claimed on the phone that their products are “authentic Star Wars costumes“, but because of licensing I am curious to see exactly what that means in reality. 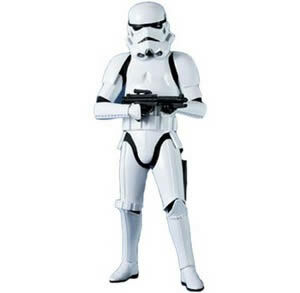 As I am reasonable tall, a Darth Vader costume might look good, but my plan is to go in the generic looking Star Wars stormtrooper outfit, complete with Star Wars blaster (and sound effects if I am lucky). The games playing kid in me is coming out already! The reason for choosing this costume is that probably a lot of people will come in duplicate costumes and having two dozen Darth Vaders or Obi-Wans running around will be a bit cheesy. At least if I go in a storm trooper costume then we will actually look better if there are a lot of us. Another possibility is to try the clone trooper costumes as that is slightly less well known and so might be rarer. We will have to see what is available. 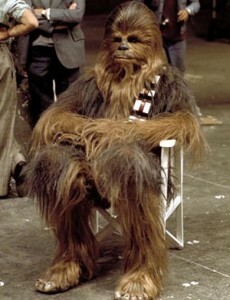 Whatever happens I am not going as a Wookie! Perhaps wearing a fur suit in the middle of summer to look like Chewbacca is a bit too much like suffering for my art. My plan is to get my partner in a Princess Leia outfit if possible and find a realistic Star Wars stormtrooper outfit for myself. This sort of nicely relates to the first movie, but no doubt the guys would prefer the Princess Leia slave girl costume from The Empire Strikes Back. Hard luck guys… Her outfit should quite easy to find and fit as it is sort of a Greek Toga style of dress, but I kind of have some misgivings about getting a stormtrooper helmet that I will be able to speak/breathe in, but we will see.